PUBLISHED IN: Originally 2008, revised and re-released 2016. SUMMARY: A young woman on her first real job decides to become an astronaut, which in the late 21st century is equivalent to a truck driver or a merchant sailor, i.e., a tough working-person’s job. After she’s involved in a fatal accident in training, she gets a posting on a small ship going to Mars. Halfway there, the ship gets hijacked by pirates, damaged, and she is the sole survivor of the original crew. She offers to help repair the ship in exchange for her life. The story then becomes one of her trying to escape the pirates. THE BACK STORY: This was my very first novel, and was inspired by Heinlein’s “The Rolling Stones.” But I found that I couldn’t entertainingly pull that off, so I brought in pirates. When I wrote the book, there wasn’t a lot of fiction set in the Solar System, and what little there was focused on “the first mission.” I wanted more “routine” (for certain values of “routine”) solar fiction, so I rolled my own. After a number of drafts, I decided to self-publish in 2008 in order to force myself to work on other novels. In 2012, I sold a loose sequel to The Mars Run entitled Pirates of Mars to Hadley Rille Books, another small press. Due to medical issues of the owner, the sequel to Pirates, The Night Watch, didn’t get published. I ended up taking all three books to Cincinnatus, re-editing The Mars Run, and releasing all three as a trilogy. WHY WOULD SOMEONE WANT TO READ IT? There’s still not a lot of new SF set in the solar system, and even a lot of that (see “The Expanse” series, which is great) has aliens as a key plot point. Here, it’s just us humans. I also use realistic technology and extrapolate from current international space law. 2) Chris Gerrib speaks my language when it comes to pirates and action-packed science fiction adventure novels. I remember Pirates of Mars (Book 2 of the Pirates series) and how much I enjoyed it. Last night I finished reading The Mars Run (Book 1) and it was fun. 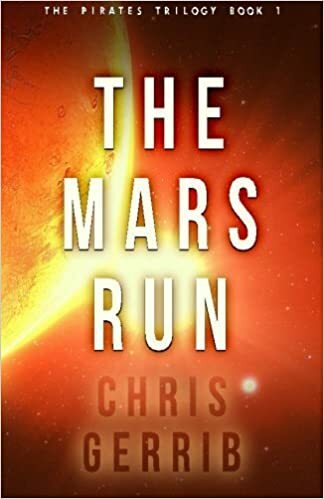 AUTHOR PROFILE: Chris Gerrib admits to being a bit obsessed with Mars, but in a healthy way – all three books of his Pirate Series are set on Mars. Chris still has a day job as the IT director at a Chicago-area bank, and holds degrees in history and business from the University of Illinois and Southern Illinois University. He also served in the US Navy during the First Gulf War, and can proudly report that not one Iraqi MiG bombed Jacksonville, Florida while he was in the service. In his copious free time, Chris is a past President of and currently active in his local Rotary club. AUTHOR COMMENTS: I’m a big “muddle in the middle” person. I dislike or don’t believe in dystopias or utopias. Reality tends to be somewhere in the middle, and that’s what I was shooting for here. I’m also a big believer in the idea of taking ordinary people and putting them in extraordinary circumstances. We expect the flagship of the Federation to be able to handle any problem. How does the garbage scow deal with things?